It's time-change - Martech Team presents a new solution for the Ford Visteon units based on the TMS470 processor. The process of unlocking is to read the original code of the processor. Whole procedure is very simple and requires only a connection to the test points on the motherboard. (you don't need any additional expander, only direct connections to the Clip Port2). - Application is payable - for PRO users it's 149 EUR, for SEC users it's 99 euros netto. To increase comfort - this module is build-in the RCD PRO. Any questions, orders inquires should be directed to shop@martech.pl. Naszedł czas przełomowych zmian - Martech Team przedstawia nowe rozwiązanie dla radii Ford produkcji Visteon, opartych na procesorze TMS470. Proces odblokowania polega na odczycie oryginalnego kodu z procesora. Cała procedura jest bardzo prosta i wymaga jedynie połączenia się z punktami testowymi na płycie głównej. (nie potrzeba żadnego dodatkowego expandera, tylko bezpośrednie połączenia z Port2 do radia). - aplikacja jest płatna - dla użytkowników PRO wynosi 149 euro netto, dla użytkowników SEC wynosi 99 euro netto. Wszelkie pytania prosimy kierować na shop@martech.pl . If you don't see your radio part number in list, check what's cpu inside and choose one of general models. wiring (pinout in the program). zapis danych z pamięci eeprom. podłączeń (pinout w programie po wybraniu modelu). 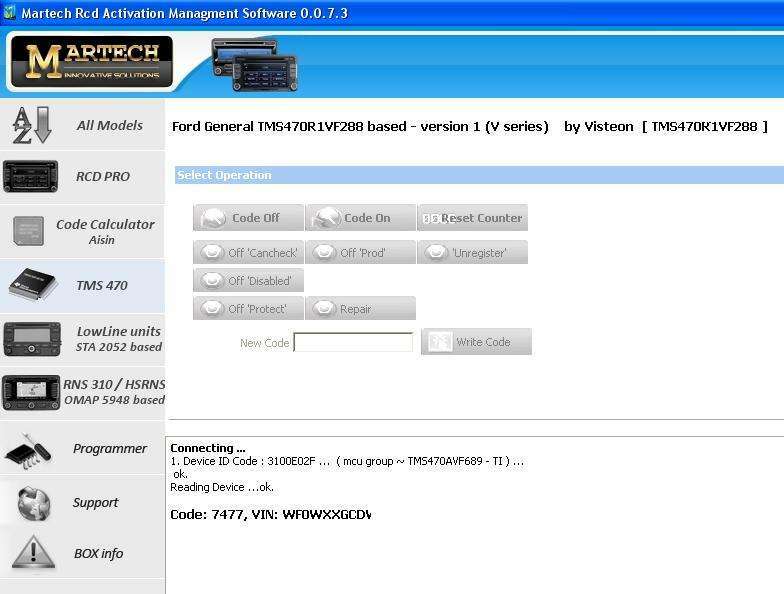 Actual version allows to service VIN in Ford units based on TMS470.